We finally hit our fist 50° day and it is already the end of March. The winter has been long and any sign of spring is welcomed! Kevin and Liz are in town so they could spend time with her family over Easter weekend. A few weeks back when I heard they were coming out we decided to meet up for dinner. We also invited Jon and Laura. Once all confirmed I called Bar La Grassa (Minneapolis warehouse area) for reservations. If you have not eaten there I truly recommend it as the food is excellent and a great value! Our dinner was schedule for Thursday and after I finished my last meeting that day, I headed to the kitchen to see Chris. As luck would have it, it was after 5:00pm and she had a grin on here face as she had just opened a bottle of wine. She told me she was hoping to surprise me but I came into the kitchen too soon. In her hand was a bottle of 2010 Croze Chardonnay of Gary’s. Chris had pulled the cork and was pouring us both a glass. We started talking about of day and then discussed what we were planning on eating out. Chris favors the home made GNOCCHI with CAULIFLOWER and ORANGE they make and was thinking I would order the CAVATELLI with BRAISED RABBIT. The Chardonnay was tasting really good so I grabbed my tasting sheet and proceeded to take some notes. Prior to drinking our Chardonnay Chris cut up a small cheese platter to pair with the wine. A very nice Gold hue with a slightly pale color depth. The 2010 Croze Chardonnay was very aromatic and fruity. We could smell green apple, pears, and pineapple. It was full bodied and the acidity was good. 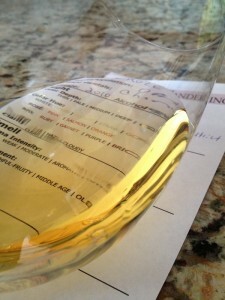 The Chardonnay was very flavorful and when we tasted it, it initially started out crisp with a soft and buttery finish. I could taste Green apple and the finish was long and pleasurable. The Rosemary Goat Cheese paired perfectly with the buttery finish of the Chardonnay. We finished our glass of wine and I inserted the wine stopper while pumping all of the air out. I placed the bottle back into the wine cooler and it was time to head out to dinner. We enjoyed the remaining glass of wine left in the bottle prior to Friday’s dinner and it was still excellent the second day! I rated the 2010 Croze Chardonnay three glasses. Chris argued her case and felt it was more like four glasses. While we were enjoying the wine I had to read the side of the bottle. There was a note about the wine and where it came from. I quote “Croze Chardonnay comes from the Simone Vineyard in Napa Valley’s Oak Knoll District. This 10 acre, mid-valley vineyard produces full bodied, luscious wine with a delicate buttery finish. Winemaker Gary Wooton produced only 4 barrels of this special wine.” I do agree the wine is special! There is an upcoming Croze and Smith Wooton wine dinner at Nectar in May. We are looking forward to Chef Kevin’s wine and food pairing. It will be nice to see Gary too! Lovely comments. You describe our wine so well!